Theme: Weight Room Workout. Pretty much a top-to-bottom progression with, in order, LATS, DELTS, PECS, ABS and GLUTES. 18A. Red-eyes, e.g. : LATE FLIGHTS. I pretty much unilaterally declared a few years ago that I won't take red-eyes anymore. I fly the day before and get a good night's sleep. 41A. Black suit component : ACE OF CLUBS. I wanted "Ace of Spades" to mark the passing of Motörhead's Ian Fraser "Lemmy" Kilmister on Tuesday. I saw the band in LA about 15 years ago and I'm not sure my eardrums have recovered. RIP. Not to everyone's taste, so no link. 58A. Like some weightlifters, and a hint to this puzzle's circles : MUSCLE-BOUND. Lovely reveal - the muscles start and finish - so bind - the theme entries. Oh dear! Bottom-up and right-to-left corrections fixed everything eventually, but it certainly was a fun journey. 1. Dernier __ : CRI. The latest fashion. 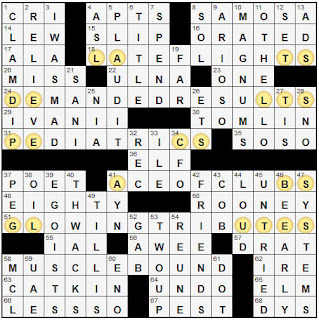 I'm not familiar with the term, but it's a crossword staple. 4. They may have EIKs : APTS. Eat-In Kitchens. I'm not familiar with the term. Do you sense a pattern here? 8. Savory Asian pastry : SAMOSA. Food! I'm familiar with the term. Yay! (Crafty cook tip - if you want to make quick and easy samosas, slice a flour tortilla across the equator and fold & fill from there). 14. Kareem, once : LEW. Alcindor/Abdul Jabbar. A UCLA basketball legend in my home town. 15. Berth place : SLIP. The yacht I've chartered lives in a slip in Marina Del Rey. 23. Points for a free throw : ONE. Kareem made a few of these on his way to 38,387 career points. 48. Number in a Verne title : EIGHTY. Not TWENTY as I confidently entered at first. "Around the World in Eighty Days". I've done the round-the-world route twice (once in each direction) on business. Burbank - Denver - Frankfurt - Mumbai - Hong Kong - San Francisco - Burbank was the most fun. LAX - Hong Kong - London - LAX seemed more of a chore. 55. Suffix with part : IAL. Boo. A suffix isn't "three letters at the end of a random word". 67. Annoyance : PEST. That "Part-ial" is a pest. 68. Bad start? : DYS. Whoa! Here's a pattern. 4. Silent comm. method : ASL. American Sign Language. My friend has a Masters degree in deaf studies and has taught me some rudimentary signs, enough to make a polite exit from otherwise awkward social situations. 9. Melodic passage : ARIOSO. I think I remembered this. Took a couple of tries after the ARI--- though. 10. Wine buys : MAGNUMS. Two bottles, or 1.5 liters. Here's a couple I pulled out of the fridge in anticipation of the holidays. They don't fit in the rack. The one on the left is signed by the winemaker. 26. "Star Trek" staples : ETS. Extra-Terrestrials. Pretty much all you're going to meet on a mission to explore unknown galaxies. 27. Quaint contraction : 'TIS. I mark my annual "oh really, is that all you've got" calendar by the first of the ADS I hear using this. This year was "Sleep Number" beds, who proclaimed in mid-November that "'Tis the season to save money on a mattress". Shame on you. 33. Martinique, par exemple : ILE. Isle, for example. What differentiates an isle and an island in English? I don't believe any other language makes the same distinction. Discuss. 41. Writer Rand : AYN. Gimme, thank you very much. I was struggling in the middle (and top, and bottom and left, and right). 42. '90s-'00s hit sitcom for 10 seasons : FRIENDS Cue the music. I challenge you not to clap. Pa Pa Pa PAH! 43. Ear piece? : COB. What? Oh! Sweetcorn (sound of coin dropping slowly). 47. __ analyst : SYSTEMS. I was one of these once. I'm not sure I really knew what I was doing. Thankfully I was working for a bank, not Boeing. 49. "Coca-Cola Cowboy" singer : TILLIS? Who? 54. See one's old college chums, say : REUNE. Here's my most recent "reune" in London last month with my chums. I'm the only one wearing glasses, but everyone else needed me to read the menu. What does that tell you? 58. Commonly injured knee ligament, briefly : MCL. The medial collateral ligament, not the anterior cruciate, which was my first attempt. A rugby-playing friend of mine once tore his ACL, but he insisted on describing is as his "crucial ligament" which drove me to distraction. It's on a par with someone saying "pacifically" or "supposably". You're off my Christmas Card list with any of those. 59. Federation in OPEC : UAE. The United Arab Emirates, a member of the Organization of Petroleum Exporting Countries. It all sounds rather quaint. Are Venezuela in on the OPEC act? 60. "Small Craft on a Milk Sea" musician : ENO. Not ONO. Wake up, Steve. 61. Semicolon? : DOT. Lovely. Half a semi-colon is a single dot. Wonderful. And with that, here's the grid, circles and all, for those of you who didn't have them in your publication. It's been a fun year, and on this New Year's Eve, please all of you be safe, love your friends and family (and tell them that you do), remember with joy all who have passed and lit up your life and be ready for a new adventure tomorrow. Theme: Having a go at it - or - disappointing Yoda. The last word of multi-word in-the-language phrases are all synonyms for striving to achieve something. 17 A. It may lead to an acquisition : TAKE OVER ATTEMPT. One corporation ATTEMPTS to take over another. 28 A. Coalition : JOINT ENDEAVOR. Working together for a common goal. Rather a different shade of meaning, as compared to ATTEMPT. 48 A. With "the," one's best shot : OLD COLLEGE TRY. This is a wild and desperate ATTEMPT to achieve something, perhaps with a bit of showboating along the way. As I see it, all except JOINT ENDEAVOR carry some implication of failure, realized after the fact. Does that seem right? Hi, gang, JazzBumpa here. Nicely constructed theme, with a couple of grid-spanners. The rest of the puzzle lies before us. Shall we do or not do? 1. Coors "malternative" : ZIMA. A kinda-sorta quasi-beer-like fluid from a company that makes other beer-like fluids. 5. NFL ball carriers : RBS. Running Backs. Who will be the first to take this DF? 8. Silently understood : TACIT. That's one sense of it. Another is simply remaining silent. I have several segments of The Nutcracker marked TACIT. 13. National Air and Space Museum movie format : IMAX. Large screen movie presentations. 14. Culturally affected : ARTY. 16. Shrine to remember : ALAMO. As the phrase "Remember the ALAMO" reminds us. 20. Bucket filler : ICE. One of many possibilities. 21. Cooking oil brand : MAZOLA. Corn oil. 22. Sport with masks : EPEE. Fencing. 23. Nag's comment? : NEIGH. Just horsing around - not emulating the Bickersons. 25. Binding words : I DO. Marriage. 27. Stately tree : ELM. Once upon a time. 32. SeaWorld swimmer : ORCA. Shamu the killer whale. 33. Strauss' "__ Rosenkavalier" : DER. The knight of the Roses. DER is the nominative singular masculine definite article in German. 34. Source of ultraviolet rays : SUN. And infra-red, and visible light, and even a small amount of X-Rays. The solar spectrum actually peaks in the visible light region. 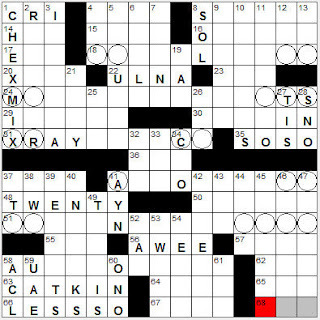 I'm not delighted with this clue. 35. Evidently is : SEEMS. Appears to be. 37. Enthusiasm : VIM. Usually travels with vigor. 39. The Masters or The Open : MAJOR. Golf tournaments. 43. Aurora's Greek counterpart : EOS. Goddess of the dawn. 45. Beat a hasty retreat : LAM. Here a verb - not it's most common usage. 47. Yawner : BORE. Uninteresting performance or presentation. 51. Dashboard meas. : MPH. Miles Per Hour. 53. __ Jose : SAN. California city. Do you know the way? 54. Race paces : TROTS. Well this interesting and brings out the pedant in me. In harness racing, there are two varieties of races, for TROTTERS and PACERS. They have distinctly different gaits, and breaking stride can lead to disqualification from a race. In other races, where you sit down right on the horse, running is done at a full gallop. So I'm not sure what this clue is getting at. 57. "We can do it, team!" : LET’S GO. Closely related to the theme, but not in an appropriate location. 59. Belittle : DIS. Disrespect, in street talk. 65. Maneuver around : EVADE. Or avoid. I'm never sure. 66. Jordanian queen dowager : NOOR. Lisa Najib Halaby [b. 1951, Washington D. C.] is an American woman who became the 4th and final wife of King Hussein [d. 1999] of Jordan. She works on behalf of several international organizations. 67. Vacationing, perhaps : AWAY. Perhaps on a business trip, the lam, or playing hooky. Several possibilities. 68. Know without knowing why : SENSE. Oh, what a feeling. 69. Second afterthought: Abbr. : PPS. Post Post Script. For when your thoughts are really untimely or disorganized. 70. Daughter of Elizabeth II : ANNE. Born Aug 15, 1950. She had two marriages and survived a kidnapping attempt. She also has a criminal record, having violated both the speed limit and the Dangerous Dogs Act. She is not to be confused with anther royal Anne who was the eponym for a common weed, a furniture design, and a neckline with a raised back and open front. Oh, yeah - the earlier ANNE was also Queen of Great Britain from 1702 until her death from a stroke in 1714. 1. Pasta choice : ZITI. Medium sized pasta tubes. 2. All-in-one Apple : i-MAC. Desktop computer system. 3. Act in a conciliatory way : MAKE NICE. Whether you want to or not. 4. Log splitter : AXE. Log splitter's tool. 5. Plundered : RAVAGED. Plunder is the violent and dishonest acquisition of property. Ravage is damage severely. Not at all the same thing. 6. Khrushchev's successor : BREZHNEV. Leonid, born 1906, General Secretary of the Central Committee of the Communist Party of the Soviet Union from 1964 until his death in 1982. 7. Texas ALer : STRO. Astros, an American League baseball team, inexplicably named after George Jetson's dog. 8. What Tweety tawt he taw : TAT. Like this. 9. Out of the wind : ALEE. Gimmee shelter. 10. Pitcher in the woods : CAMPER. Tent pitcher. 11. Spur on : IMPEL. Basically the same meaning as propel. The use of "IMPEL" has been steadily declining for 200 years. 12. Tribal symbol : TOTEM. A spirit being, sacred object or symbol that serves as emblm for a clan or tribe. 15. Connecticut Ivy Leaguer : YALIE. Student or graduate of Yale University. These people are also know as Elis. 18. Fail to say : OMIT. Leave out. 19. "Voilà!" cries : TADAS. "There you are," or "I did it." 24. Glossy coating : ENAMEL. Paint or the natural covering layer on your teeth. 26. Egg cell : OVUM. Female reproductive cell in humans and animals. 28. "__ Boys": Alcott sequel : JO'S. A Sequal to "Little Men," occurring 10 years later. 29. Rock to refine : ORE. Pay dirt. 30. Practice exercise : DRILL. A method of training and discipline. 31. How money might be lost : ON A BET. One of many ways. 36. Fixes the fairway, say : SODS. Here, a verb, meaning to install sod. 38. Soda jerk's workplace : MALT SHOP. 40. Makes a note of : JOTS DOWN. 41. Boston Garden hockey immortal : ORR. Bobby. YouTube has several long video compilations of his highlight moments. Here is just one, and perhaps the most famous. 42. Spanish king : REY. 44. Milan's Teatro alla __ : SCALA. Opera house since 1778, one of the world's leading venues for opera and ballet. 46. Business deals : MERGERS. The joining of two companies to make a new, bigger entity. The opposite of what I had the last time I blogged. 48. John Glenn, for one : OHIOAN. Do you know any others? 49. Words often starting a long shot : ONE IN . . . Often followed by . . . a million. 50. Blunder : GOOF. All GOOFs [in this sense] are mistakes. A blunder is a stupid or careless one. 51. Dungeons & Dragons spellcasters : MAGES. D & D has several categories of characters, each with its own unique powers, potentials and vulnerabilities. 52. Demonstrate as true : PROVE. Provide convincing evidence. 56. Tacks on : ADDS. Emends. 58. Sporty car roof : T-TOP. Removable roof panels make a vehicle so equipped into an almost-but-not-quite convertible. 60. Farsi-speaking land : IRAN. 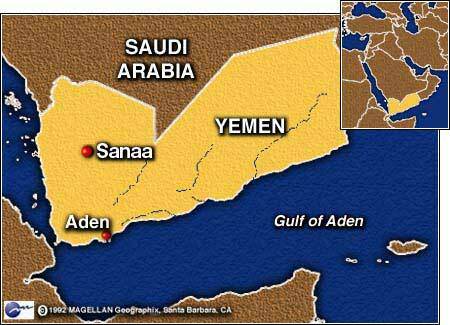 Across the gulf from Saudi Arabia, and contiguous with several other countries. 61. Eye sore : STYE. An inflammation of a sebaceous gland in the eyelid, generally caused by a staph infection. I opted not to show any pictures. 63. Membership cost : FEE. AKA Dues. 64. LAX overseer : FAA. Federal Aviation Administration. Are they lax? I haven't flown in years. You can enlighten me in comments. Did you get the TADA, or did you not do? That is the question. Argyle here. Plenty of entries so a few tricky spots. Mine was the left coast, middle. 9. Infielder Rod in Cooperstown : CAREW. Remember him from last Thursday? And someone new 65A. Hall of Fame second baseman Bobby : DOERR. Wiki for this Red Soxer. 14. "Caught you!" : "A-HA!" 20. Olympics skating analyst Ohno : APOLO. He was a short track speed skater. 30. Buying plan with a down payment : LAYAWAY. Odd clue. 42. "__ 101": Jamie Lynn Spears sitcom : ZOEY. Britney's sister on Nickelodeon. 52. "That's shocking!" : "I'M AMAZED!" 56. Triumphant cries : TADAs. A welcomed sound. 3. Spread on a BLT : MAYO. Should Steve have blogged today or what? 4. City near Stanford University : PALO ALTO. Located in Santa Clara County and the State of California. 12. List-ending abbr. : ET AL. 34. 'Til Tuesday lead vocalist Mann : AIMEE. I didn't know she is a bassist. 46. Loud, raucous sounds : BLAREs. Like a tie-up at rush hour. 63. Suffix with trick : ERY. Enough trickery for one day. Theme: By The Numbers - 40's, 50's, 60's. Argyle here. If there is more to this than ending in double-digit numbers, I don't see it. Not as complex as Warren's Ground Hog Day puzzle last Feb.
1. "__, poor Yorick! ": Hamlet : ALAS. Hamlet: Act 5, Scene 1. 16. Vivien of "Gone With the Wind" : LEIGH. Katie Scarlett O'Hara Hamilton Kennedy Butler. 18. Walt's friend, and enemy, in "Breaking Bad" : HANK. No idea. 19. "L.A. Law" lawyer : ARNIE. No idea. 27. Brit. reference : OED. The Oxford English Dictionary originally published in 1884 and there is an interesting story behind it, too. 60. Eponymous swindler Charles : PONZI. Quite a schemer. 62. Fed. power dept. : ENER. 65. From Chicago to Boston : EAST. For those with no wish to head West. 2. "Bad, Bad" Brown of song : LEROY. There is a nice bio about Jim Croce with the clip if you go to YouTube. 8. Slammer : POKY. Jail. 48. Be effective : CUT IT. Can you cut it? 50. Yoga posture : ASANA. I'm starting to learn it - the word, not the positions. 55. Farm storage cylinder : SILO. Nit free today, I hope. Theme: "Extra! Extra!" - The first word spells out "What's black and white and red (read) all over?" 23. *Bugs line : WHAT'S UP, DOC? We also have GAZETTES (27A. Martha's Vineyard papers). Part of the clue dupes the answer a bit. Simple theme. When I saw "hidden" in the reveal clue, I thought the key words might be hidden in the middle and span across each theme answer. 1. Duchamp genre : DADA. Nailed it. Easy upper left corner. 5. Toot one's own horn : GLOAT. Had BOAST. 15. Prepare for a birth, in a way : NEST. Got me. I did not think of birds. 21. Check : DETER. Simple one-word clue is often a bit tricky. 33. Single or double : BED. You had HIT also, right? 34. Title teacher in a 1967 film : SIR. "To Sir, with Love". I thought of Mr. Tibbs, who's not a teacher. 46. Part of a Latin trio : AMAS. Amo, amas, amat. 55. Sounds heard with a stethoscope : RALES. And 114D. Arid : SERE. Both are words we used to see a lot in the old Wayne R. Williams puzzles. 60. Agcy. with facilities in Denver and West Point : US MINT. Did not know the West Point locale. Thought the answer might be military-related. 61. Ben Jonson epitaph words : ORARE. "Pray for Ben Jonson”. 74. 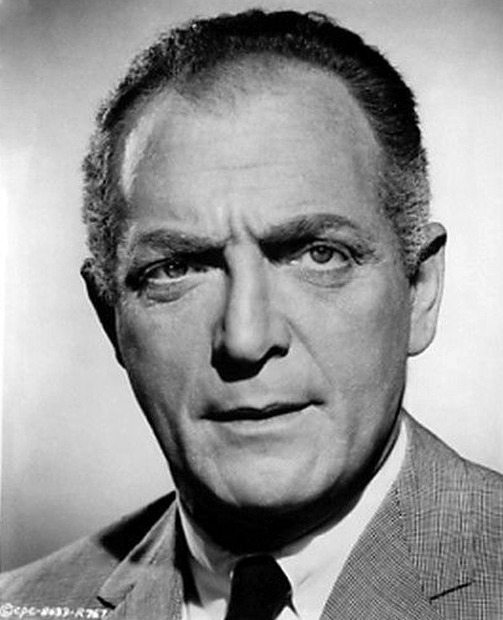 Everett of "Citizen Kane" : SLOANE. Drew a blank. Just could not get into "Citizen Kane". 79. Quake danger : TSUNAMI. Scary image. 86. Baker with Grammys : ANITA. Nailed it. 87. BC and Cal, e.g. : SCHS. Thought of Canada. 93. Indian wrap: Var. : SAREE. SARI is the correct wrap. 102. Weighty refs. : OEDs. Oxford English Dictionary. Light when online. 111. Polytheistic creed : PAGANISM. I thought "Polytheistic" is some kind of plastic. 117. Pope's muse : ERATO. Alexander Pope. 121. 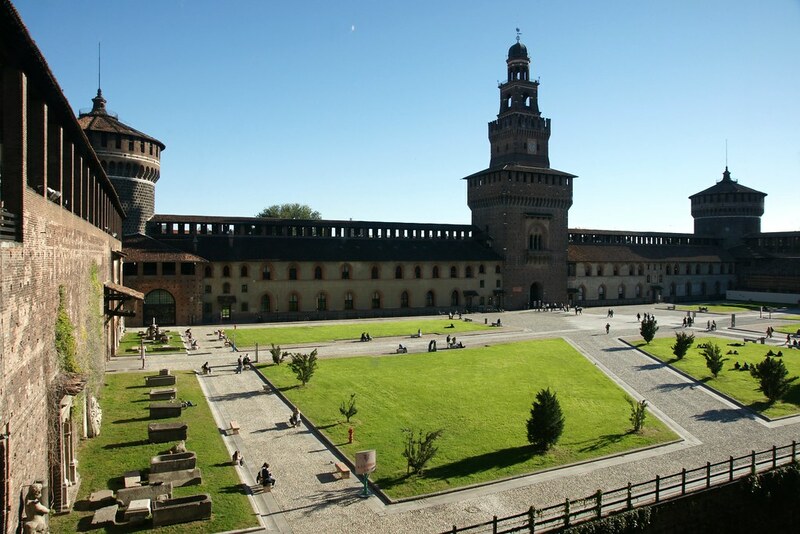 Home to the Sforza Castle : MILAN. Well, Splynter might know this castle. Not me. 122. 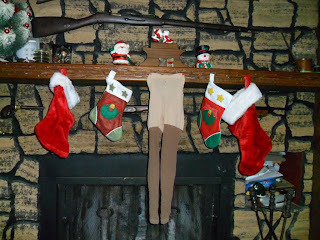 "Buckaroo Holiday" ballet : RODEO. Also unknown to me. See here. 123. Driver's warning : FORE. On the tee box. Not HORN. 1. University of Georgia athlete, familiarly : DAWG. Already had DAW? in place, so easy answer. 5. Wheat protein : GLUTEN. 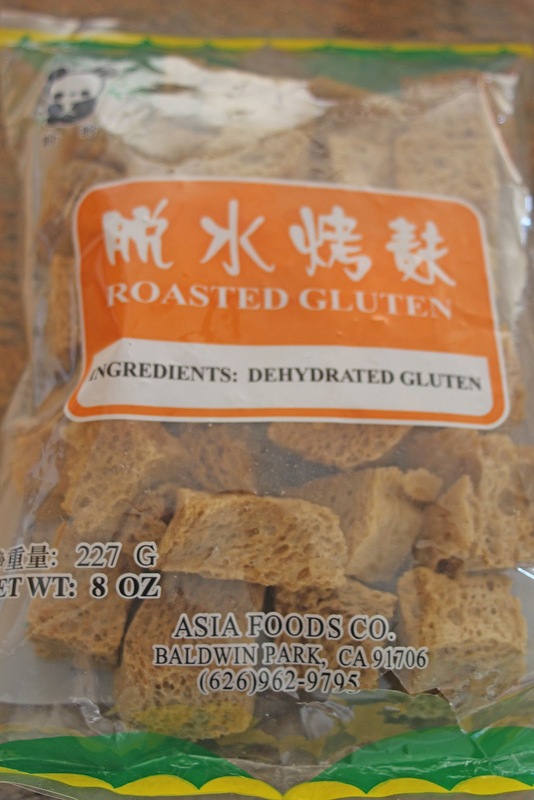 If you like Shanghai cuisine, you probably know dried gluten. Very tasty when properly prepared. 9. Sleuth, slangily : TEC. Detective. 11. Prefix with ethics : META. New word to me: meta-ethics. 14. Bit of this, bit of that : GRAB BAG. Thought of our own grab bag cards. Kids like them. 18. Tiger with a red scarf : TONY. Tony the Tiger. 24. Ancient gathering place : STOA. Or AGORA. 29. Sushi bar suppliers : EELERS. Love eel, never met an eeler. 35. Letters before two cents? : IMHO. Loved the clue. 36. Whatever the weather : RAIN OR SHINE. And 43. Tricky force tactic : POLICE STING. Great fill. 39. Tough guy : THUG. Those Isis guys are just thugs. 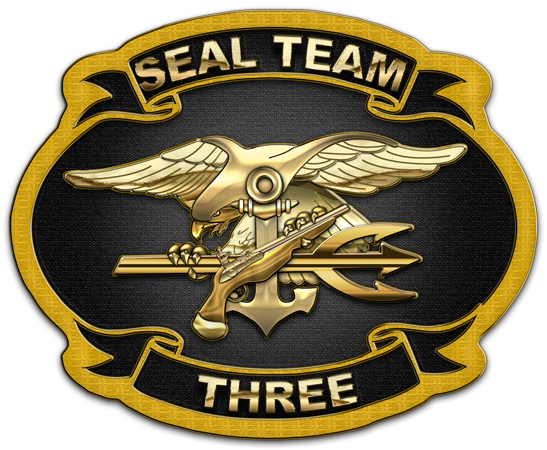 I won't call them tough guys. 45. Sweet and sour : TASTES. Have you had Kabocha before, Jayce/Steve? Eager to see if D-Otto likes his. 67. Many a concertgoer : TEENER. Most of us just say "teenager". 70. Move nonchalantly : SASHAY. Hi there, Lucina! 81. Keyboardist Saunders and crossword immortal Reagle : MERLS. We'll never see a genius like Merl again. 87. Tee sizes, initially : SML. Huh, "initially?" 89. Nautical pronoun : HER. Had SHE. 98. Encourages : EGGS ON. Come back often LaLaLinda. 101. Graph revelation : TREND. Gary would have linked a terrific graph. 109. Area where a pass may be needed : HALL. All crosses. Disadvantage of never attending any school here. No "hall passes" in our schools. 111. Xing people? : PEDS. Ah, I was thinking of stars. Xing (level tone) means "star" in Chinese. Happy Birthday to our pilot Dudley, who's been with the blog for over five years. Any adventurous plans today, Dudley? This picture was taken during Montana's visit to Northeast in September, 2013. 32. Noodles and beans dish : PASTA e FAGIOLI - isn't this the classic 'slander' for Italians and the language~? 15. Coaster section : LOOP - guess on my part, but then again, what else in 4 letters~? 24. 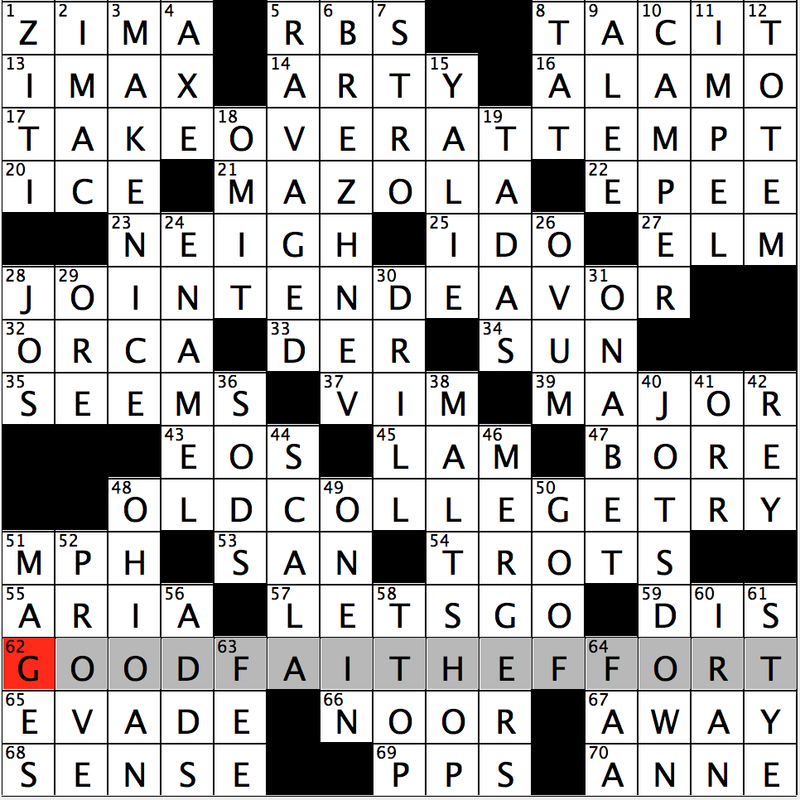 Grouse or carp : KVETCH - pondered a single word for "fowl and fish"
38. Road warning : HONK - I was thinking "SIGN"
56. Miracle Mets star Tommie : AGEE - I tried "JOHN", but he was TommY, and a Yankee - not a fan of that team, being from L.I. 58. "Fingers crossed" : I HOPE - and an IHOP clue at 36d. Theme: I before E and then wait and C. Your Christmas present is a structured anagram wrapped inside a pun without any Christmas carols. I am back for my final blog of 2015, and fittingly it is to write up a Jeffrey Wechsler creation. By my impromptu count, this will be the 15th one I have done in '15. This is a wide open grid with 63 theme letters and 93 white squares not near a black one (open). The center is a grid spanning fill with triple sevens in the NW and SW and triple sixes in the NE and SE. Each theme fill has has a very consistent four letter ending anagram with an I in the middle and a silent E at the end. When I saw lite and mite I was thinking maybe a word ladder was coming our way, and tire seemed confirm that until rite popped into my head and then I 'saw' the earlier anagrams. I wish I could come up with a FIRE/ RIFE fill to make it a ladder as well, but I am sure JW already saw that path was closed. Lots of common crossword fill (e.g. AREA, ETNA, ETE. IRA, AMI unusual for Jeffrey) and a few of his trademark multi-word fill. Let's unwrap this baby. 19A. Word game for beginners? : SCRABBLE LITE (12). I like the clue and fill , but I did not see the gimmick here. TILE becomes LITE. 27A. Ordinary little insect? : STANDARD MITE (12). TIME becomes MITE. Very nice clue, I do hate those dust mite pics. 37A. Radial destroyed during testing? : SACRIFICIAL TIRE (15). Sacrificial RITE is what made me understand where JW was going. Funny fill. 45A. Fate of one constantly reliving the past? : CIRCULAR LIFE (12). The ever needed circular FILE for all of those great interoffice memos that appear in a big firm. 55A. Memoirs of an African river explorer? : I WALK THE NILE (12). We will let Mr. Cash sing us into the rest of the puzzle. 1. Sport enjoyed by Henry VIII : TENNIS. This FACT I learned watching the TUDORS on Showtime. 7. Goes for broke : RISKS ALL. 15. Sitcom friend of Jerry : ELAINE. 16. "It eludes me ... " : I DON'T SEE. And generally I do not care. 17. Olympian drink : NECTAR. Depends on who you ASK. 18. Great Sand Dunes National Park location : COLORADO. You want to see? LINK. 21. It starts in juin : ETE. Juin is June in French, not too hard to guess. 23. Fund-raising target : ALUM. Friday so you get no hint that it is an abbreviation. 32. Chancel neighbor : APSE. 35. Edge : INCH. You can edge toward someone or inch like INCH BY INCH. 36. Metaphoric vilification : MUD.No politics, so no mudslinging. 42. Waterfront org. : ILA. Those fun longshoremen. 43. Penicillin, often : CURE. We will not ask what we are using it to cure. 44. Province of Catania attraction : ETNA. We just had this. 51. Indefinite pronoun : ONE. Not male or female. 52. U.S. Army award since 1918 : DSM. Distinguished Service Medal. 61. Liqueur made with Jamaican rum : TIA MARIA.. Some HISTORY. I never knew this brand was owned by the people who also owned Kahlua. 64. Ancient looker : ADONIS. Slightly censored I guess, here with Venus. 65. Inborn : IMMANENT. One of a confusing TRIO. 66. Hotel supply : LINENS. 67. Security booth site : MAINGATE. Disney? 68. Green Party concern : ENERGY. 3. Mother-of-pearl : NACRE. The inside of the shell or the outside of the pearl. 4. Female rock guitarist Strauss : NITA. Hmm, I WATCH and am reminded of a recent female bassist. 5. "Soon" : IN A BIT. 6. Landlocked European nation : SERBIA. There are 16 landlocked countries in Europe: Andorra, Armenia, Austria, Belarus, Czech Republic, Hungary, Kazakhstan, Liechtenstein, Luxembourg, Macedonia, Moldova, San Marino, Serbia, Slovakia, Switzerland and Vatican City, only one has six letters. 7. Dirty __ : RICE. Interestingly, Barry Silk had the fill DIRTY RICE and 20D. Vietnam Veterans Memorial designer : LIN both in his November 14 offering. 8. One with loyal followers : IDOL. and 14D. Confident and loyal sort, so it's said : LEO. 9. Most piano sonatas : SOLI. One player. 10. Square or slip follower : KNOT. 11. Continuous flow : STREAM. Like videos these days. 12. Botanist Gray : ASA. I was ready for this thanks to Mark Bickham and the slew of obscure ASA clues. 13. Wasn't behind anyone : LED. 25. Rush hour improbability : U-TURN. Two days in a row. Much nicer than UIE or UEY. 26. Euripides tragedy : MEDEA. An oddly unsuccessful PLAY about the tragedy of Jason. 27. Sun. address : SERmon. 28. Kitchen gadget : DICER. The earlier rice made this easier. 29. Singer DiFranco : ANI. 30. Alabama label : RCA. Does anybody really care about record companies any more? 31. UPS competitor : DHL. 32. Cold __ : AS ICE. All I heard was THIS. (3:15). 33. "The Python Years" diarist Michael : PALIN. Everyone get the spelling correct now? 34. Like nightmares : SCARY. 38. Hosp. section : ICU. Intensive Care Unit. 39. Spoon extension? : FUL. You want one MORE? (2:32). 40. Investment initials : IRA. Individual Retirement Account. 41. 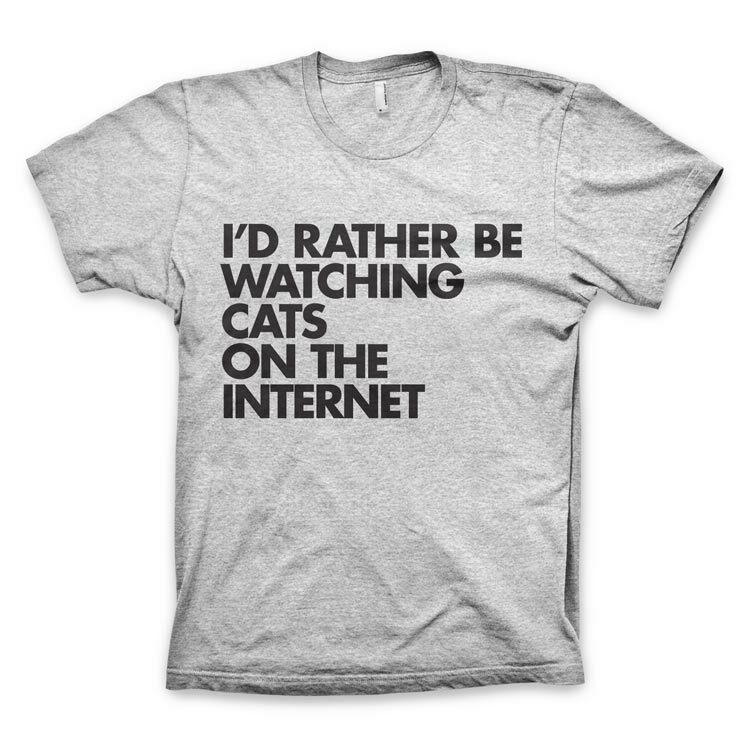 Apparel with a message, perhaps : TEE. A xmas present for CED? LINK. 46. South American crocodilian : CAIMAN. I hope you all remembered these little guys. 47. Developer's offering : LOT. Real estate developer. 48. Checkup request : INHALE. Did you play doctor when you were little? 49. Supply with, as carrots to a food processor : FEED IN. Did we have this recently? 52. 24-hour eatery, often : DINER. 53. Medical support : SLING. 56. Big name in early computers : WANG. Does history REPEAT? 58. Home filter target : LINT. 59. The Duchess of Cambridge, familiarly : KATE. 60. "... for __ of woman born / Shall harm Macbeth" : NONE. Jeffrey's dose of Will. 63. Côte d'Azur companion : AMI. We end with French, so I will say à bientôt, and hope you all are having a great Christmas. Thanks for sharing your lives here at the Corner. And JW, thank you for a really great year. Lemonade out. 1) Happy Birthday to Kathy (Yellowrocks), who's now in New York celebrating this special day with her son and his family. She continues to inspire me with her positive attitude facing various difficulties in life. I'm so happy that she can now dance like she did before her knee surgeries. 2) Happy Birthday also to Lorraine (Fermatprime), who's been with the blog for a long time. Lorraine is an accomplished math professor and swims daily in her own heated pool. She also does more puzzles every day than most of us.